It's certainly the fashion to post about the year in review at the moment, what with it nearly being over and the world poised to leap into the new decade. I could certainly go into many details about the year past that would keep this blog post going until the world ends because the Mayan calendar runs out or something, but many of those things are intensely private and not items that I wish to put out there. Suffice to say that this year was not the best for me. It's been a long, hard journey and has certainly had some very low and rocky moments. (Oh no. I'm starting to sound like a bad 80s power ballad. I promise this bit won't last long.) Things are getting better and I'm starting to make some very necessary changes to my life and to myself. To my support network, thank you for everything. For just being there, for the random messages, for the tea, sympathy, coffee, knitting, DVDs, laughs, and above all your company. Thank you. I've learned a lot about myself and changed a lot in the past 12 months. Whether any of the lessons are useful remains to be seen. My taste and style have changed too, and I'm picking up things that I had set aside for so long. Hello video games, music, art and generally creative pursuits again. It's been a slow uptake as I learn to let myself have this time for these activities again. I seesawed a little in terms of my fitness regime and weight. At the moment I am happy with where I am. I am back into running. I am doing two boxing classes a week. I've acquired the Wii Fit Plus software and balance board for core strength and rainy day exercises. I'm well placed to kick start the new year and keep working on my fitness. 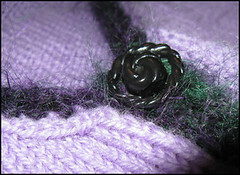 Knitting-wise I reached an important milestone this year. I finished my first cardigan. A whole garment - done. Admittedly it took a lot longer than it really should have, as there were long periods this year where I wasn't really knitting much. But it is done, and I am so happy to have completed it. The style is no longer what I would consider in a cardigan. It's loose with little shaping, but even if I only choose to wear it around the house, it's mine and I made it myself. 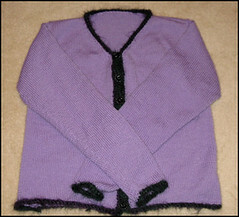 It's also warm and a little luxurious - a merino, mohair and cashmere blend with a mohair trim. I particularly love the buttons. Not many other knitting projects surfaced this year. In general I neglected it. That's something to fix. I'm sure there is so much more to write about, but at this very moment it's escaping me. Not to worry - rather than focussing too much on the past I need to look to the future. Which is what my next post will be about. Well done; was worth the time and effort. I to love the buttons. A wealthy and healthy 2010 for you.